Of the many WW1 Internment sites across Canada, there has yet to be a permanent site where visitors can come and learn about this dark chapter of Canadian history year round. 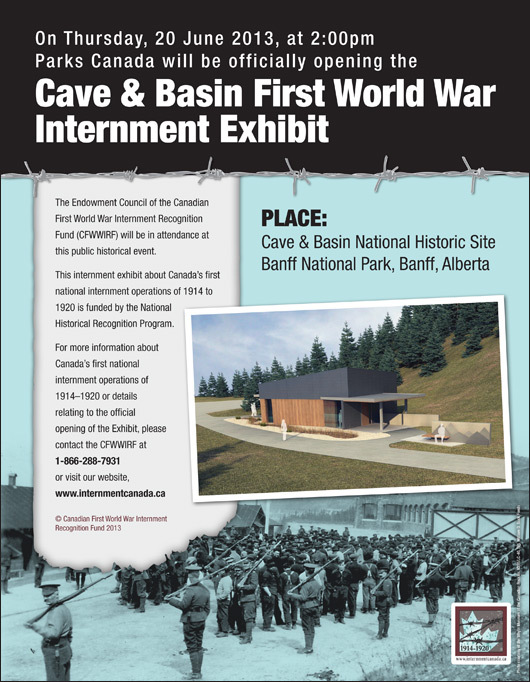 The Castle Mountain Internment Camp, which later moved down to Cave & Basin (home of the original hot springs), was one of the harshest and most abusive camps which helped build Banff National Park, Canada’s most historic national park. On June 20th, this site will open the first permanent exhibit to WW1 Internment. Restored to its condition as a forced labour camp, the site is central to the Canadian parks experience, as well as Canadian and Ukrainian-Canadian history. Also check out the Facebook event page.